Apartment building on av. Van Dyck, at the main entrance to Parc Monceau. We've had perfect weather for the past two days. On Friday, we walked all they way up to Parc Monceau, where we found a nice bench in the shade. There we watched people -- mostly other adults who were relaxing like us, some in the sun, some in the shade. But there was also a fairly good collection of schoolchildren who'd just been let out of school. The children came in two basic sizes: middle-school age, and early high-school age. They were engaged in a ritual: attacking each other with shaving cream. The longer we sat, the more kids we saw who'd been creamed. A not-to-serious fight broke out when a mob of smaller kids attacked a bigger kid. They knocked him down into some bushes, and creamed him. Then the bigger kids got together and called in reinforcements. One of them came over to us and asked us which direction to go for the main entrance to the park. We told him. Minutes later, he came back with a half a dozen more big kids. The big kids huddled, the smaller kids noticed them, and then they ran. The big kids ran after them. After that skirmish, lots more creamed kids were walking around. One girl lost her tank top in the struggle. She was wearing her bra, and clutching her tank top to her front side. 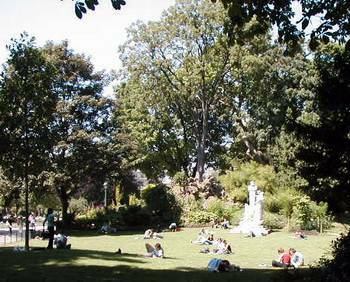 People relaxing in Parc Monceau. We had walked to the park along avenue Georges V, in front of the American Cathedral where there seemed to be a funeral in process. We crossed the Champs Elysees, looking for a series of shopping galleries that were on our map. We eventually found them, only to discover they were modern and, like City Center in Columbus, had lots of vacant stores. The occupied stores weren't nearly as interesting as shops on the street, so we didn't tarry. 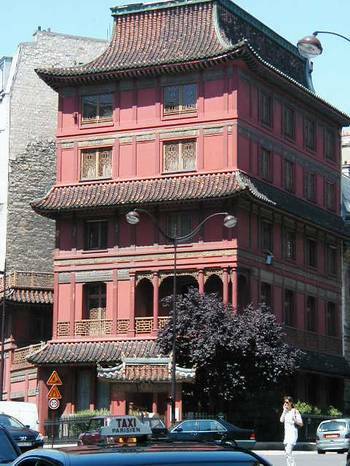 We walked up rue de Courcelles and were surprised to see a pagoda-style building ahead of us as we came around a bend. It turned out to be a "gallery" of Asian decorative arts, but we figured out it was really a shop so we avoided going in. Who knows what we would have bought. But I do know we don't have room for anything more! 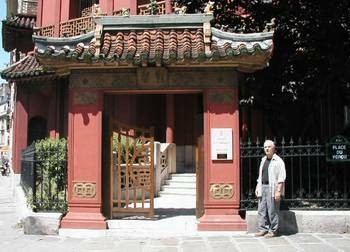 The Chinese roof tiles on top of the gate in front of the pagoda-like building were authentic-looking. Tom is interested in building a gate like this someday. The route we took back to the left bank involved the av. de Messine, the rue Miromesnil, and then av. 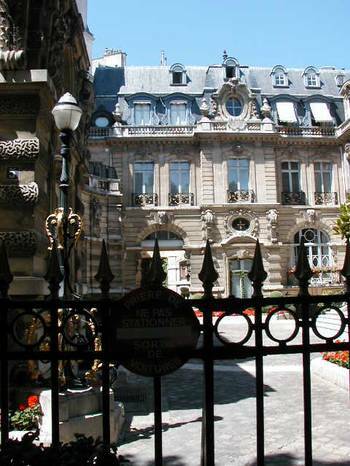 de Marigney, right past the Palais de L'Elysee which has LOTS of security. The American embassy is near there, too. Walking down av. 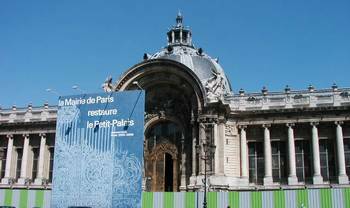 Winston Churchill is to be flanked by construction fencing because both the Grand Palais and the Petit Palais are undergoing massive renovation. The work has been taking years, it seems. We look forward to seeing these two museums/exhibition halls completely open again. Then we crossed my favorite bridge, the Pont Alexandre III. A bride and groom were having their pictures taken on the other side of the bridge. We stopped for drinks at tea time at a brasserie called the "Recrutement." We've done this several times on our way back to our neighborhood. We sit quietly, watching "tout le monde" pass by. 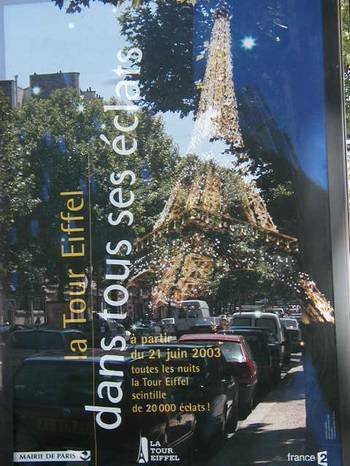 As we walked home we noticed this poster which reminded us that the next day was the "Fete de la Musique." Sometime after 11pm, the new scintillating lights on the Eiffel Tower would be illuminated for the first time. The temporary scintillating lights that had been installed for 2000/2001 were so popular that the bureaucrats decided a high-tech, longer-lasting scintillating light system was required. They secretly ran a test of the lights earlier in the week, so everyone knew that Saturday's event would not be a dud. The system consists of 20,000 flashes. It is supposed to last for ten years, or 10 million flashes of light. Thirty-some mountain climbers were hired to install the lights, using 40 kilometers of wire and 60 tons of metal pieces for attaching the wire and lights. The lights were allowed to scintillate all night last night, but from now on, it will be just the first ten minutes of each hour during the night. The cost? 4.55 million euros. We watched on Saturday night, from the kitchen window in the apartment. 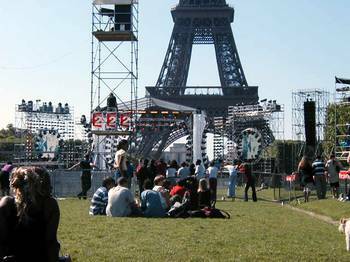 At left you see preparations being made on the Champ de Mars for the Festival of Music. This Saturday celebration consists of music being played at all kinds of places all afternoon and evening. It is in its 22nd year! The biggest show of all is on the Champ de Mars, in front of the Eiffel Tower. 500,000 people attended, so we found it easier to watch the show on TV, in the comfort of the apartment. Last night, this stage became a glittering high-tech venue. The round screens you see here project a greatly enlarged, live video image of the entertainer so that even people far back on the Champ have a chance of seeing something. On our way home on Friday we saw and heard one of the singers doing a test of the sound and video system. Then we saw and heard her sing the same song again on TV last night . . . "Je vais te chercher." 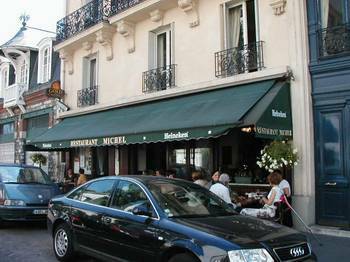 Restaurant Michel, rue de la Manutention, just over the Passerelle Debilly. On Saturday, we did something we rarely do - we ate lunch. Generally, with this low-carb diet we eat protein for a late breakfast and then we aren't hungry again until dinner. But Tom was hungry so we stopped at a restaurant we've been wanting to try. In prior years, by the time we would think of it, it was closed for vacation. But here we were, and the place, Restaurant Michel, was open. We sat outside partly because it was nice, but partly because the entire interior was filled with one big group. Because all the windows were open, we felt like we were still part of the group. We decided it had to be a political group, and not a right wing or extreme left wing group. We found out from our waiter that we were exactly right. The food was okay. The atmosphere was terrific. I had a "Salade Romaine," which is the closest thing to a caesar salad one will find in France. It included large shavings of top-notch romano cheese, and a bit of parma ham. The small size salad was plenty. On our way to Restaurant Michel, we stopped after we'd crossed the Passerelle Debilly to see if we could find the cat that lives aboard the Julia. 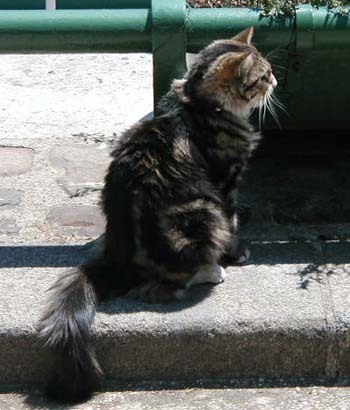 Instead, we found this cat, whom we'd met in prior years, who lives aboard the Salamandre, I think, next to the Julia. This fine, intelligent, and very beautiful feline came right up to us and we petted him and complimented him for at least twenty minutes. He looks very much like General Burnside who is at the summer "spa" (e.g., Gulf Coast Veterinary Clinic) receiving water treatments (subcutaneous fluids) and a special renal diet. He'd rather switch places with this animal. We found Friday's dinner at Oh! Duo. This place is so good that I'm sure we'll go once a week. The foie gras there is buttery smooth, rich, and so memorable. Saturday's dinner at Bistro des Cigales was a bit of a dud. Evidently that place is not consistently good. Pastel is open again, so we'll probably substitute it for Cigales on our list. 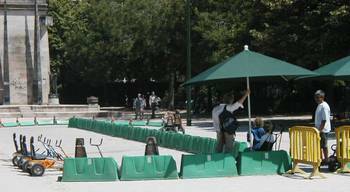 A race course for tots in the Champ de Mars. Le Parisien's "word of the week" is "geek." According to this paper, a "geek" is a person who spends all his time on the computer, even after work. But this is different from a "nerd" who is completely closed to the outside world. A "geek" has a social life and a girlfriend who may or may not share his passion for computers. If female, the "geek" is not called a "geekette." And both are adept at "geekeries." (Example: "Let's stop our geekeries for a bit and go get something to eat.") In line with the noun, there is a verb, "geeker" (to geek) that means spending hours on the Internet, even if it is just to check e-mails. More about the Festival of Music . . .